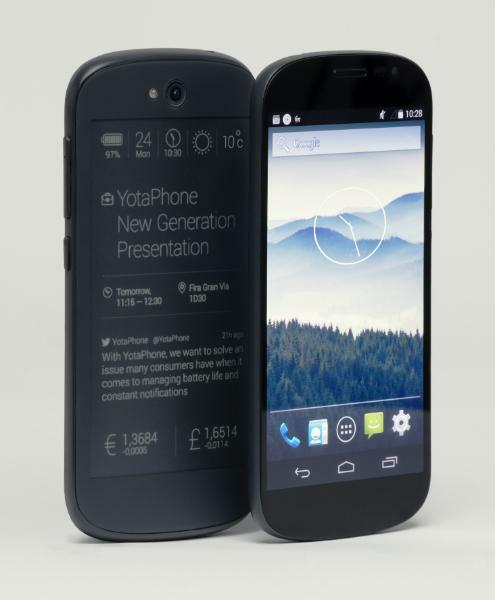 The dual-screen YotaPhone turned quite a few heads when it was officially unveiled at last year’s MWC. In a market where so many of the products look and feel much the same, the Russian company behind the YotaPhone offered a handset with a twist – not one but two displays. The first comes in the form of a conventional high-definition color touchscreen while the one on the opposite side features, more interestingly, a Kindle-like E-ink display. A year on – despite it being only a few months since the device finally hit the market – the company has unveiled an updated model, again at MWC. The new version now sports a 4.7-inch E-ink display, a significant increase over the 4.3 inches of the original model. But more importantly, it’s now touch sensitive. That’s right – on the old model you controlled the E-ink display via a touch zone below the screen, but not anymore. There’s more detail in the display, too, with its pixel resolution boosted to 960×540, up from 640×360. The color touchscreen has grown as well, to a decent 5 inches (1920×1080 pixels). The relatively small screen sizes on the old model were a bit of a drawback, making it look outdated by today’s standards, but the introduction of these decent-size displays are sure to encourage more consumers to take a closer look at this intriguing device. The second-generation YotaPhone is a little slimmer than before, while the square corners on the old model have been rounded off. The rear-facing camera remains at a respectable 12 megapixels, while the front side, previously sans camera, now comes with a 2-megapixel shooter. Improvements under the hood of this unusual Android phone include a new quad-core processor, a step up from the old dual-core offering. YotaPhone’s secondary display can be used as a quick-access notification center for a range of information, from the time to social media updates to new messages to weather reports. If you’re an e-book fan or regular user of text-heavy sites, the E-ink display will get plenty of use, while the regular HD color screen is still there for viewing photos and video, playing games, and the like. And with fast-draining batteries still an issue for so many smartphone owners, the device’s low-power E-ink display could be a real boon for many users, with the company claiming more than 50 hours of use on a single charge. The new YotaPhone hasn’t been priced yet, though it’s expected to cost around the same as a high-end Android smartphone when it goes on sale later this year in Europe and the Middle East. Disappointingly, there’s still no word on a US release.